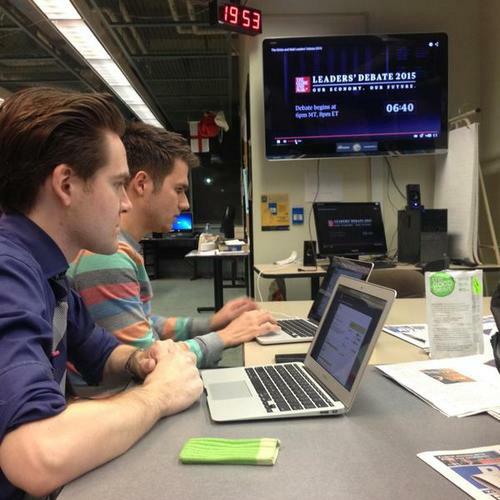 And we're live for the Ryersonian's coverage of the Globe and Mail's leaders debate in Calgary. Send your comments to us! We have Ryerson economist Eric Kam with us today. Prof. Kam, what are you watching for in the debate today? Any unanswered questions you're hoping to hear about from the leaders? I always like to hear the leaders discuss their view of the economy in both short and long run visions. Also, I want to see who plays the demand card, and who plays the supply card. Sounds like Mr. Trudeau is focussing on demand with his infrastructure plan, no? Yes, and he's also playing the "deficits don't matter in the short run" card. ...and he has a solid point if you believe in demand management to stimulate an economy. Balanced budgets are a fascinating topic, but in terms of fiscal policy, it's almost a moot point as long as debt is denominated in your own currency. You can't let it go nutty - but you can definitely, safely run a deficit without the walls coming down. Are his $10 billion deficits nutty, or responsible? Some might be scared away by the NDP and Greens hard stance on the projects though perhaps? Green party are not a legitimate choice. They are a fringe party. Sorry to say that to those who support them, but they are not a real player. They (the Greens) made news recently announcing complete abolition of tuition though. Hits hard with our readers. Any reality to that, or complete pipe dream? Better chance of me waking up tomorrow with Jennifer Aniston beside me. The Green Party can make crazy promises, it really doesn't matter. But is it possible? Would eliminating tuition crash the economy? Some students might be thinking of voting for them on that basis. Eliminating tuition would do nothing other than make the waiting list for Canadian universities longer than it is at present. Tuition is around $7000 - and there are waiting lists. Fair enough. What could the federal leaders do to increase affordability and access without increasing the waiting lists? You can increase the number of grants - you can increase the number of forgivable loans. And the official debate starts! Send your questions via Scribble Live or the hashtag #RUGlobeDebate! ...but, and students won't like this - you need to invest in yourself - and investing in yourself implies, at times, going into a negative financial position. If you believe the literature, and there is tons, you will make back the money you invest into a degree many times over. Harper isn't wrong as per se - but he's very vague. You can balance the budget in many creative ways - but generally, as the real world sets in post election, government explains why the budget cannot be balanced. Again, Harper is correct on that point. Haha... and he loves to talk about the middle class. The stability of our banking system is rather wonderful. We don't do everything well, but we really get the idea of stability of our financial intermediaries. All the leaders like to tout the merits of small business, is it true that they create the majority of jobs?